One of my key goals of this COP16 was in setting a meeting with the Japanese government officials and learn about Japanese initiatives for solving climate change related problems. There are three reasons. Firstly, as a Japanese, I am very much interested in how Japanese advanced technology is applied for those issues. Secondly, I would like to contribute to Japan by let Tuck students know the Japanese initiatives for those issues. Finally, I would like to contribute to the Tuck by learning and sharing how Japanese government and private companies collaborate in this particular area. I made an appointment with Japanese officers from METI (Ministry of Economy, Trade, and Investment). I was so excited to have the opportunity to listen to the (hopefully) successful Japanese story of its technologies related to the environment, and in the area of policy coordination. However, a day before the meeting, a shocking bit of news arrived: a key climate negotiator for Japan, Mr. Jun Arima, announced publicly that the Japanese government would never sign up to another set of emission reduction targets under the Kyoto Protocol, and that, if fact, the Kyoto Protocol – named so because it was signed in the famous Japanese city – should be thrown out. As a result of this announcement, Japan won the 1st place of ‘Fossil of the Day’ prize from an association of NGOs. What happened to Japan? Where is its leadership/initiative in climate change sector??? I was so confused! This was the biggest headline of the first week of COP16. So, who is one of the two METI officials with whom we had the meeting on Wednesday? Mr. Arima himself! He is also the Deputy Director General for Global Environmental Affairs at METI. 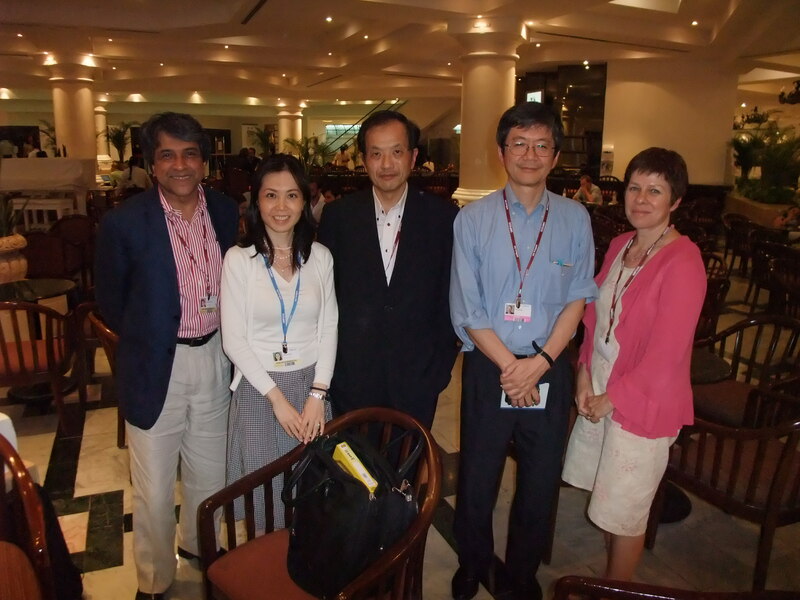 The other was Mr. Hiroshi Asahi, Director General for Energy and Environmental Policy. We had the opportunity to ask several questions including the one regarding above news. Surprisingly, their answers were not only very straightforward, but also logical, thoughtful and well-examined. 1. Japanese strategic initiative for Kyoto Protocol: Currently Kyoto Protocol covers only 27% of world carbon emission volume because large CO2 emitting countries such as China and USA are not in the framework. It is better to create a new architecture that reflects the reality of 2010 than just sticking to a protocol that reflects a 1997 reality, they said. Also the new architecture should be a soft agreements that each country can set and achieve its own individual target rather than a globally binding one, and one in which they would agree to a system of ‘MRV’ (Monitoring, Reporting, and Verification) under ‘ICA’ (International Consultation and Analysis; the COP process is full of such jargon). · Increase renewable energy (wind, geo-thermal, solar, biomass) to 10% by 2020 (For example, Iceland and Japan have the most advanced geo-thermal technologies, and 80% of Iceland’s plant and equipment for this is made in/by Japan. 3. To facilitate this industry change, Japanese government and private companies to work closely with them. The institution called “kei-dan-ren”, the association of big-name private companies, worked as an intermediately between METI and private sector, and helped them make realistic policies and implement them. Following METI’s advice, keidanren set a voluntary CO2 reduction target, and government conducts evaluation and verification of targets through relevant advisory committees every year. Also, according to Mr. Arima, a new carbon tax bill will be passed in Dec 2010. 4. The Japanese government is creating a new mechanism called the ‘bilateral offset mechanism’ to transfer Japanese energy efficiency technologies to developing countries to take advantage of CDM, whereby both Japan and the partner country can share project credits. Currently, CDM has several weakness. For example, it takes more than two years for projects to get registered and to issue a ‘CER’ or a Certificate of Emissions Reduction. Also the registration procedure costs a lot for private companies. Instead of going through this long process, Japan has decided that to pursue its own direct bilateral offset mechanism by strictly following CDM guidelines, but acting outside of it. After the meeting with Mr. Arima and Mr. Asahi, I realized that the way in which the news about Japan’s stand towards the Kyoto Protocol was portrayed by the media was just plain wrong. Not only was Japan recommending something that made sense, but the country seemed to be backing up its words with concrete and continuing actions (this, despite the fact that Japan is already the lowest emissions-intensity country of any of the major economies in the world). Perhaps the Japanese government should do a bit more on the marketing and PR fronts.